Q What are the projects that are currently being carried out by your Ministry? The human-elephant conflict has become a major issue for people in certain areas. We can’t really call it a conflict because if we could allow humans and elephants to coexist, then we wouldn’t find it as a huge issue. During the last regime an amount of approximately Rs.10 billion was spent on fencing but this is not a solution. Today we see elephants, monkeys and other animals as pests because we are clearing jungles and going against nature. We need to have a recycled system where humans and animals can coexist. 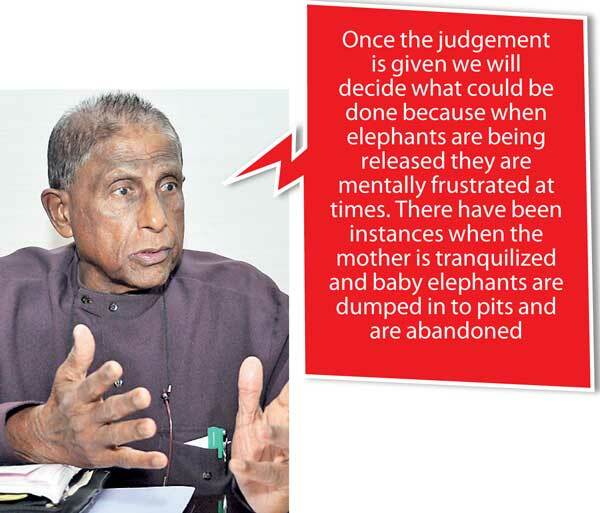 Sajith Premadasa also has agreed to pay a sum of Rs.100, 000 as compensation to a family that is affected by the human-elephant conflict. In most instances if their crops are damaged etc., but we are now paying Rs.200, 000 and throughout their life they are entitled to Samurdhi as well. There is also a major concern regarding national parks when it comes to maintenance and other issues. Park wardens sometimes cannot control the behaviour of certain visitors who visit parks and break the rules. We are trying to introduce a bird and a butterfly section to every botanical, zoological, marine and national park in order to educate schoolchildren and other visitors and raise awareness on the different species. In addition to that we are also trying to introduce herbariums as well. We need to ensure that there are strict guidelines imposed on visitors to ensure that they will treat animals and nature well. There will be hoardings around the park to raise awareness on how the park should be treated by the visitors. Tourists have gone to the extent of complaining that they cannot enjoy a good safari or any other excursion simply because the place is littered and animals have sensed danger. Therefore they cannot sight leopards and other animals. 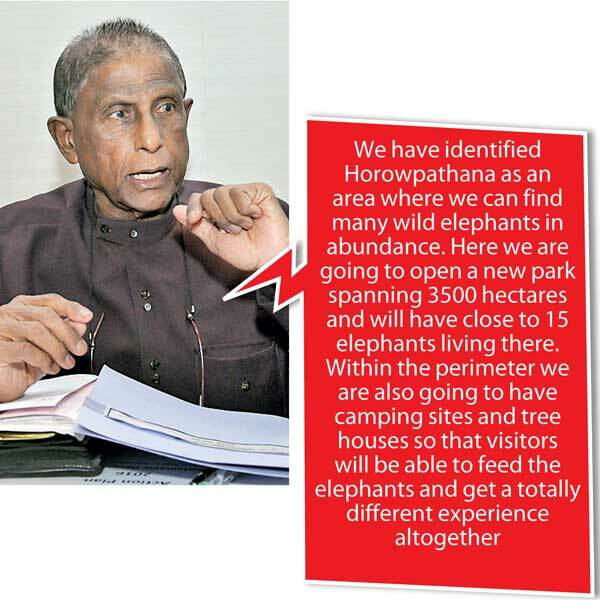 We have identified Horowpathana as an area where we can find many wild elephants in abundance. Here we are going to open a new park spanning 3500 hectares and will have close to 15 elephants living there. Within the perimeter we are also going to have camping sites and tree houses so that visitors will be able to feed the elephants and get a totally different experience altogether. QYou mentioned that people will be allowed to feed elephants within parks. Isn’t it a bad practice? Don’t you think that once they get used to this food that they will become a nuisance? Yala block 1 will be converted in to 5 blocks. Within block 1 there are 30,000 hectares. We are going to introduce entrance control and will be taking measures to discipline the staff working in the park. This is a main source of income in terms of tourism and we need to secure our resources. Back in 2015 we had 1.8 million tourists who came down to Sri Lanka and this year we are targeting 2.5 million. QIs it true that Yala will be closed for one year? The entire area is very much polluted. Since we are going to introduce this 5 block concept we will have to close it down for a few months. It has become an ugly place for tourists and the trees and animals also need rest. Q A poacher was killed last year during a confrontation between wild life officers and a group of poachers at Yala National Park. Are there any regulations imposed on poaching practices? Regulations are there but implementing them is the problem. We have been trying to evacuate the families who are living around the border but they are not willing to do so. They are linked with nature and the animals to the extent that they do not want to be evacuated at any cost. There is also an issue regarding illicit weed plantations and therefore we have sought the assistance of the Air Force to pinpoint these places and take necessary steps to get hold of the culprits. Q The Port City Project is a threat to aquatic life. What measures will be taken to protect aquatic organisms once it starts? If you go against nature it will affect you in one way or the other. Because of this project the movement of tides will be disturbed. There is a similar issue in Mirissa where we have to divert the shipping routes since they disturb the dolphins there. Q Recently a baby elephant was gifted to New Zealand. But another baby elephant ‘Anjalee’ was gifted back in 2012. Why two elephants to NZ? 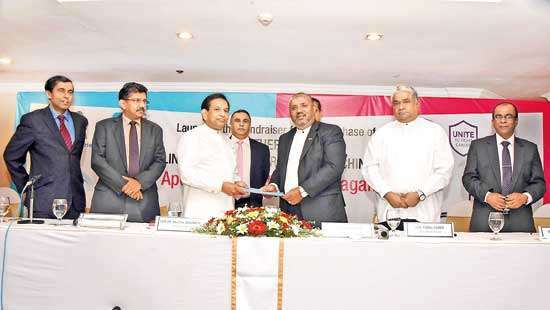 This is the result of an agreement which was signed back in 2012 by Basil Rajapakse among the Sri Lankan government, University of Auckland and the Auckland zoo. In exchange for these two baby elephants they will build up an elephant research centre here. 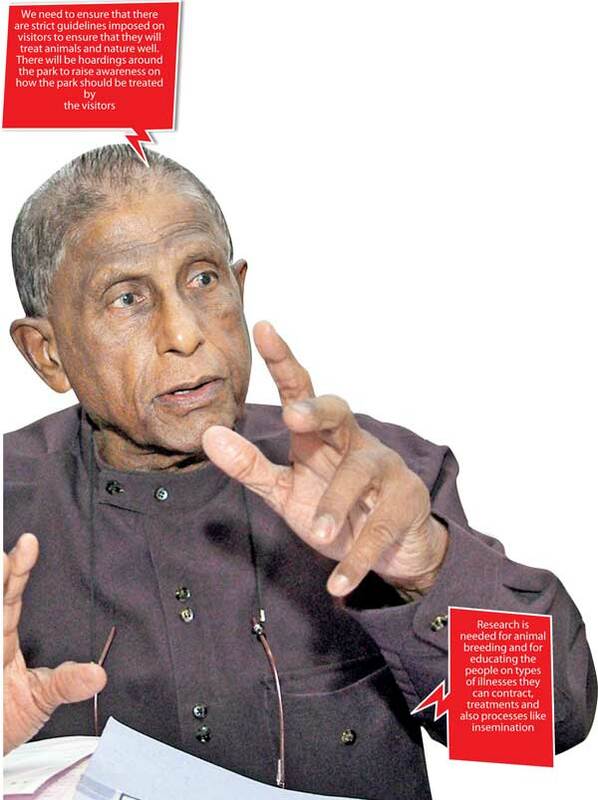 Q Is it true that ‘Anjalee’ contracted Hepatitis once it was sent there? Now it has gained 700 pounds and we have seen photos. Q Was it separated at the age of 6? Actually we don’t like to send them. We hope that they are looking after these animals well. Before sending these animals we have to get permission from the Convention on International Trade in Endangered Species of Wild Fauna and Flora (CITES). Q What about elephants that are illegally captured? Are they sent back to their original habitats? The CID carries investigations and the case is handled by the Attorney-General’s department. Once the judgement is given we will decide what could be done because when they are being released they are mentally frustrated at times. There have been instances when the mother is tranquilized and baby elephants are dumped in to pits and are abandoned. It is quite a pity to see all these. But my job is to protect all animals and ensure that they are safe. Q Is that all? What about a legal framework? We will issue a licence and charge a fee from those who are possessing elephants. The animal should also be kept within the land and I hope this will make some influence against elephant smuggling. QUsing elephants in parades and processions is not a very pleasant sight. Don’t you think that it is an unethical practice to chain and make them walk for long distances? In a way yes. But we have to consider the safety of the people as well. I would prefer elephants walking without mounds or chains but traditionally this has been the practice. QWe have the Pinnawala elephant orphanage and along with it we will have another elephant research centre. 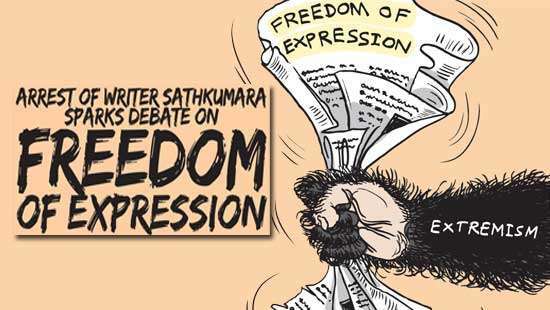 Is it really the need of the hour? Research is needed for animal breeding and for educating the people on types of illnesses they can contract, treatments and also processes like insemination. Q We see many pet shops selling different types of animals on the road side. Are these businesses registered? Good question. We haven’t really thought about it but definitely it is something we have to attend to. We need to closely look at the rights of the animals. Q Many NGOS are actively involved in looking after stray animals. Any projects carried out by the Ministry in this regard? We appreciate their efforts. The government alone cannot do all this. We should encourage the private sector to get involved in these kinds of projects. QA Flora and Fauna Protection Ordinance was introduced to ensure that the natural habitats are secured within the boundaries of the island. Where does it stand today? Has it become just another document? 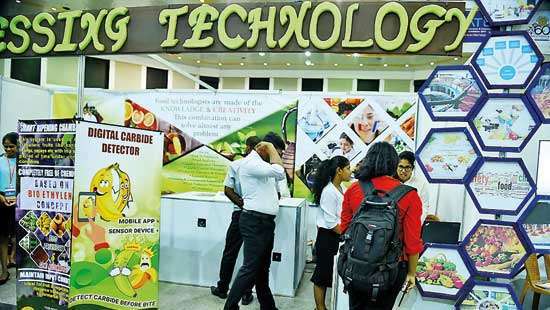 The country can generate a lot of income from these plants. We are actually training the people to become self employed. We need to promote income generation.